2018 Topps Heritage Baseball 24ct Retail 8 Box Factory Sealed CASE-1,728 Cards! This Product every year is on FIRE! We are proud to offer this Brand New 2018 Topps Heritage MLB Baseball Factory Sealed CASE! This MASSIVE Factory Sealed CASE includes EIGHT(8) HUGE Factory Sealed Retail Box! Each of these HUGE Factory Sealed Boxes includes 24 Packs and 9 Cards Per Pack for a total of 216 Cards per Box and 1,728 Cards in this 8 Box Factory Sealed CASE! Current stars, MLB® legends and rookies are showcased on these classic cards! 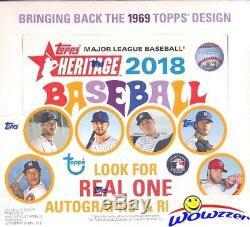 Look for Real One Autographs, Clubhouse Collection Relics, Flashback Autograph Relics and Special EXCLUSIVE Retail Only 1969 Topps Bazooka All-Time Greats Inserts Replicating the 1969-70 Topps Bazooka All-Time Greats and highlighting modern-day greats! This Year's Rookie Crop is Awesome! Look for Rookies and Rookie Autographs of Rafael Devers, Victor Robles, Alex Verdugo, Clink Frazier, Amed Rosario & Many More! Look for Real One Autographs of MLB Superstars and Legends including Nolan Ryan, Mike Trout, Kris Bryant, Hank Aaron, Reggie Jackson, Cody Bellinger & More! Collect all 500 Base Cards, 100 High-Numbered Short-Printed Cards & 100 Base Card Chrome Variation Cards! Look for Chrome Refractor Parallels, Chrome Black Bordered Parallels, 1 of 1 SuperFractor Parallels, Base Card Mini Variations, 100th Anniversary Parallels and Magenta Back Parallels! Also Look for Retail EXCLUSIVE HOT BOXES with Chrome Refractors! Plus look for Great Inserts including New Age Performers, Then and Now, Baseball Flashbacks and New 1969 Topps Deckle Edge! Good Luck with your Pulls! We stock a Huge Selection of Factory Sealed Boxes from every Sport! Plus the Largest Collection of Graded Cards in the World! Be Sure to Check out our 1,000? S of other Items for Sale. Wait to pay until all items have been won OR 7 days after oldest item was won. (Please Note - we are not open on the Weekends and Holidays). We are an Internet only company; we do not have a retail location. Get business information that counts! - Vendio Counters are active content free. The item "2018 Topps Heritage Baseball 24ct Retail 8 Box Factory Sealed CASE-1,728 Cards" is in sale since Wednesday, February 28, 2018. This item is in the category "Sports Mem, Cards & Fan Shop\Sports Trading Cards\Baseball Cards".